CLARK FOUNDATION COMPANY, was established in 1955 by Delta Township resident Larry Clark. Today, the Clark Companies includes, Clark Foundation Co, L.D. Clark Excavating Co., L.D. Clark Building Co., and Builders Aggregates. Family owned and operated for over 50 years. We specialize in residential and commercial excavating, quality poured walls and flatwork. By choosing the Clark Companies you and your builder will receive our total package system which includes excavation, quality poured walls, Rub-R-Wall waterproofing, flatwork, backfilling and grading. We provide our customers with “One stop shopping” and manage your project with construction professionals from start to finish. 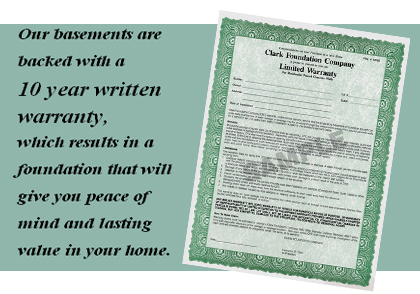 The result is a foundation that will give you peace of mind and lasting value in your home.